Investors and international business people worry about what will happen in Thailand. After the coup happened, it seems that no solutions of this turmoil can be seen in the near future. Here I would like to look at some data of Thailand and help us to understand what Thailand is. This chart shows how many percent of the total population lives in urban areas by county. 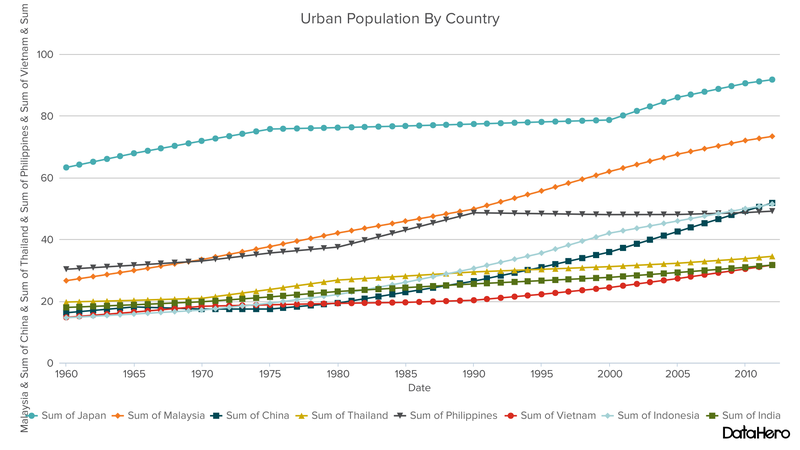 In Thailand, around 35 percent of people live in an urban area in 2012. It means that nearly 65% people live in a rural area in Thailand. This rate has increased only gradually since 2005. Compare with other Asian countries, the concentration of population is moderate in Thailand. Most reports of the mass media are broadcasted from Bangkok. However, 65% of people live in a rural area. So I would like to see what people in rural area think of the coup. This chart shows how many people use internet out of 100. In Thailand the ratio is around 26.5 in 2012. 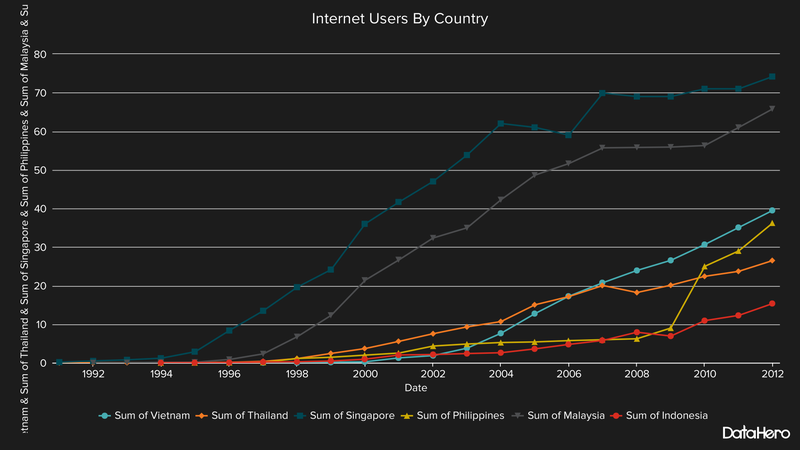 It seems that internet users are not increasing as Singapore and Malaysia in terms of ratio against the total population. There is another statistic. According to data from Social Inc., as of last month, 28 million Thailand users are on Facebook, 4.5 million have joined Twitter and 1.7 million has Instagram accounts, it means more than 40 percent of the total population is on Facebook. I think a lot of user start using the internet in Thailand recently. Not only in Thailand but also other countries which limit democracy, the first step by the governmental body is to control the mass media and the internet in the country. Although the penetration rate is not so high in Thailand compared with other countries, Military of Thailand may control internet traffic in the country. I am wondering how the tourism industry in Thailand is suffering from this turmoil. 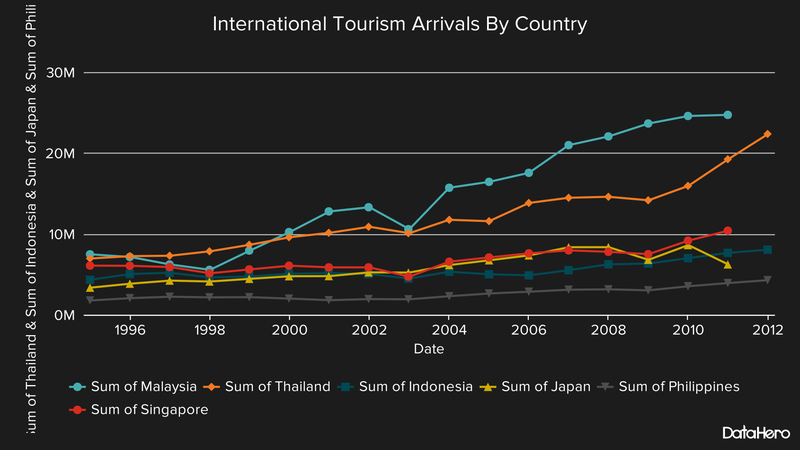 Since 2009, Tourists from abroad has been increasing steadily in Thailand. So if this turmoil and instability continue, Tourists from abroad must be decreasing. It is very bad for the tourism in Thailand. I presented only three data about Thailand and other countries here. The more data are presented, the better we can understand what the country is. Those data are obtained by Quandl, the data provide service. If you are interested in data about countries, please go to the company’s web site. You can find a lot of information in it. Once you obtain data that you are interested in, you may like to visualize them. I recommend DataHero to do it as it is very easy and efficient to do so. The charts above are created by DataHero. Is it cool, isn’t it?